Am I the only one already planning Thanksgiving? 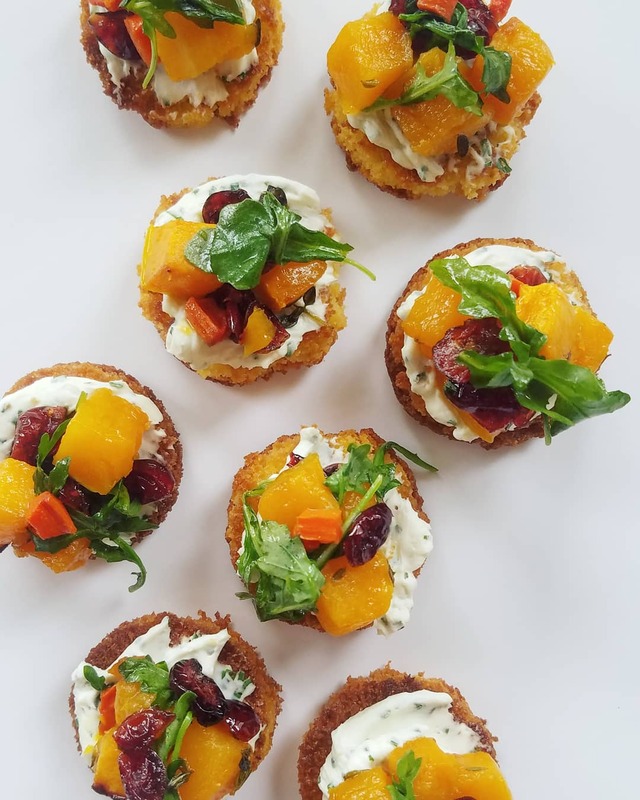 These Cornbread and Butternut Squash Bites will definitely be on the hors d'oeuvres menu, and many other menus I am sure. These were created from a happy mistake. I was originally going to do these on a French bread crostini, but I ran out. So I whipped up some cornbread, cut them into rounds, and then twice baked them so they would have a crispy, crunchy edge. I will be providing you with the recipe for the cornbread and well as the technique for how I made these little cornbread crouton rounds below. Preheat oven to 400 degrees F (200 degrees C). Add butter to a 12x12 glass or metal baking pan. In a large bowl, combine flour, cornmeal, sugar, salt and baking powder. Stir in egg, milk and vegetable oil until well combined. Add butter to pan and place in oven for 1 minute until fully melted. Remove pan from oven and pour batter into prepared pan. Bake cornbread in preheated oven for about 20 minutes on the middle rack, for until a toothpick inserted into the center of the loaf comes out clean. Allow cornbread to cool. Take a small ring mold, or round cookie cutter (about 2 inches in diameter or smaller) and cut out individual circles from the cornbread pan. Give it a twist and a little wiggle so the cornbread removes in one piece. Once you have 10+ pieces removed, use a sharp knife to slice each cornbread round in half heightwise, so you have two thinner circles. Drizzle olive oil generously onto a medium baking sheet. Place each cornbread circle onto sheet, in an individual layer, fitting as many as possible onto the tray. Return cornbread rounds to middle rack of oven for twice baking. Bake cornbread crouton rounds for 10 minutes until golden brown. Remove cornbread croutons from oven, and allow to cool. Croutons will harden once cooled. Use as a vessel for hors d'oeuvres or crumble to use in salads. Enjoy!